Weighing the Week Ahead: Will Election News Change the Course of Markets? The calendar has a lot of data, but the FOMC meeting is over. The market waits for the next big event. We will soon have another jobs report, but Monday’s presidential debate overshadows the other news. The news cycles this week will be all about the election, and the financial press will be no different. Should investors use this news to change course? Last WeekThere was plenty of economic news, and it was another mixed picture. The FOMC decision dominated. Theme RecapIn my last WTWA, I predicted a focus on bonds, especially at the long end. That proved to be one of my worst theme forecasts. 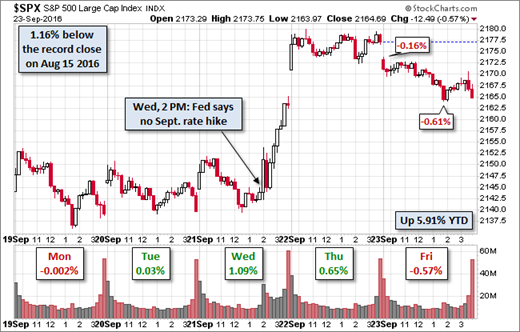 While interest rates figured prominently in the discussions, the Fed commentary quashed the selloff in the long bond. The ten-year note rates finished a bit lower than last week. The Story in One ChartI always start my personal review of the week by looking at this great chart from Doug Short. Stocks had a good, three-day rally. Doug attributes this to central bank policy – no rate increase from the Fed and the B of J.
Doug has a special knack for pulling together all of the relevant information. His charts save more than a thousand words! 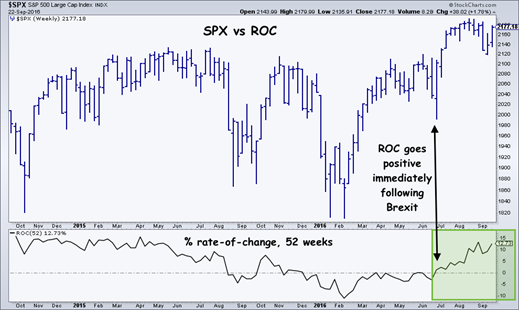 Read his entire post where he adds analysis grounded in data and several more charts providing long-term perspective. The NewsEach week I break down events into good and bad. Often there is an “ugly” and on rare occasion something really good. My working definition of “good” has two components. The news must be market friendly and better than expectations. I avoid using my personal preferences in evaluating news – and you should, too! FOMC held rates constant with a hint of increases to come. Whether or not you agree with the decision, the market seemed to celebrate. 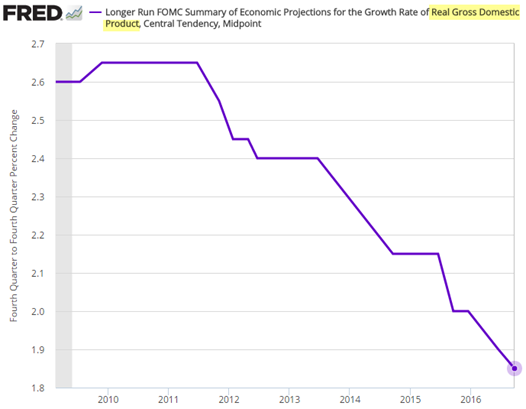 This is despite the reduction by the Fed in estimates for the long-term growth rate. The market continues to applaud stimulus over results. Earnings prospects improved. Brian Gilmartin continues to track the pace of estimate reductions, overlooked by many. He also emphasizes the rebound in technology estimates. 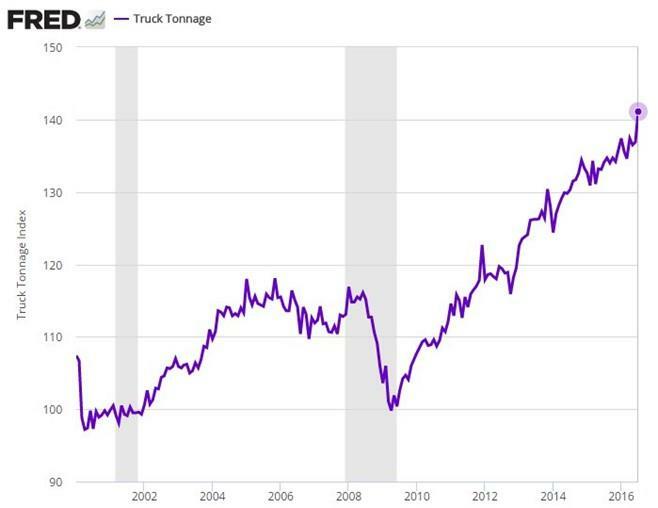 Trucking improved, gaining 5.9%, although varying sources have something of a mixed picture. Steven Hansen provides a complete analysis. Building permits increased by 3.7%. This is a good leading indicator for housing. 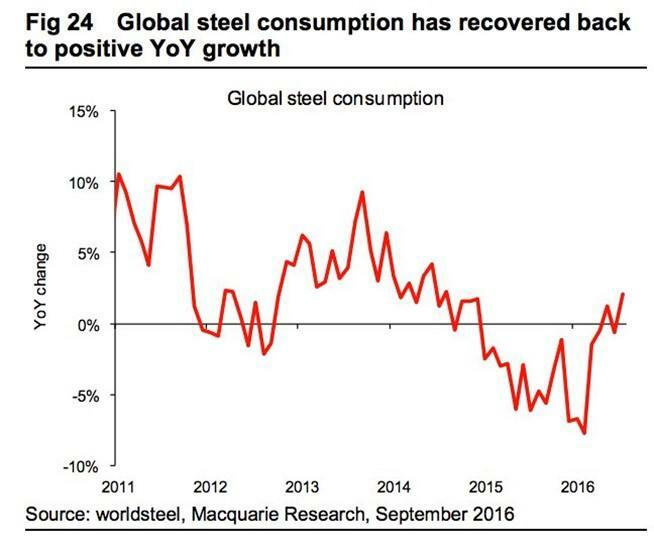 Global steel production is again positive. Saudi’s disappoint on oil. Even before the start of the OPEC meeting, they warned not to expect any solid conclusion. Matt Smith of OilPrice.com has the story. Congress and the Budget. There is only a week left before the October recess, and there is no deal in sight (NPR). Leading Indicators declined by 0.2%, missing expectations of a small gain. Housing starts missed estimates by almost 6%. Calculated Risk sees the 6.1% YTD increase as consistent with the predicted “wide bottom” in single family construction, with several years of expansion coming in both starts and completions. “Davidson” is concerned about the difficulty young people have getting mortgages because of tightened rules. He sees a possible rental bubble. (Post via Todd Sullivan, who notes that he is not completely convinced). 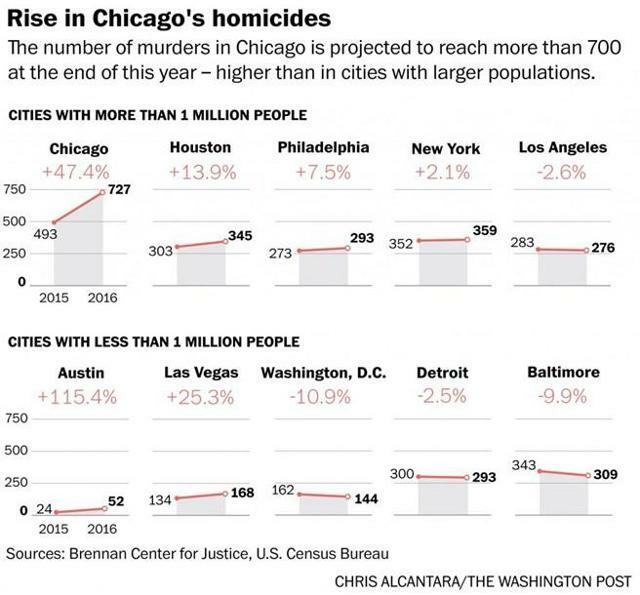 More violence. Talks have broken down in Syria, leaving the two million residents of Aleppo without water (The Guardian). Continuing incidents, tensions, and protests involving U.S. police and assorted bombings. It is not as if leaders were not trying. The U.S. and Russia have joined to back talks in Syria. 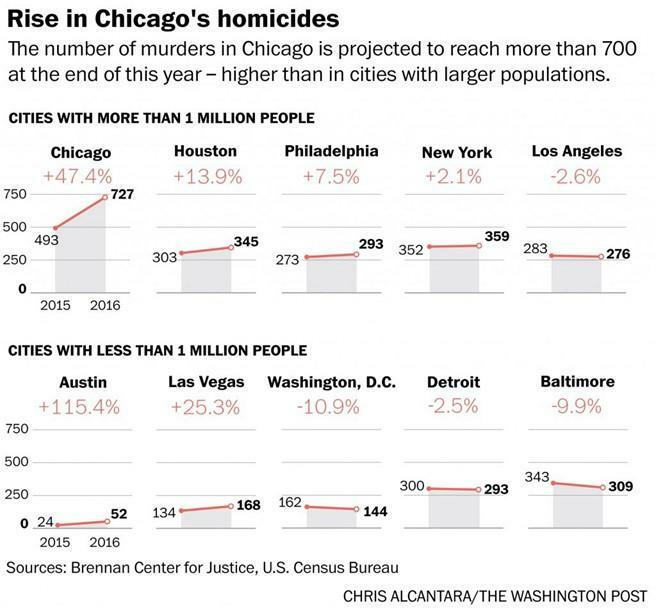 Chicago’s homicide rate is much higher. 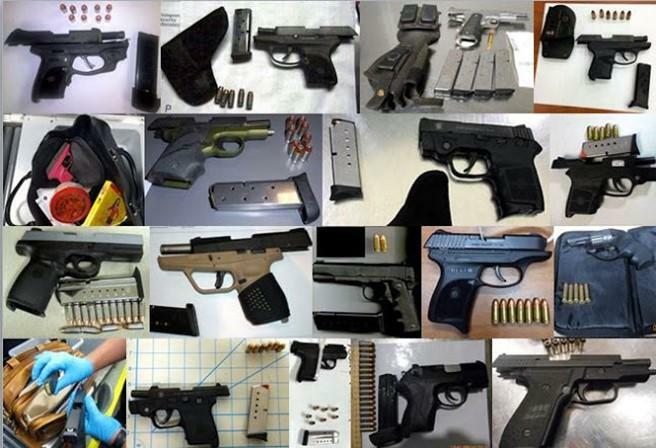 The TSA, much maligned last summer, collects hundreds of weapons each week, before they get into the aircraft cabin. Here is a typical haul of firearms. Read the entire post to see the other creative weapons. I occasionally give the Silver Bullet award to someone who takes up an unpopular or thankless cause, doing the real work to demonstrate the facts. No award this week. Nominations are always welcome. We have a big week for economic data, setting up for some important reports at the start of October. While personally I watch everything on the calendar, you do not need to! I highlight only the most important items in WTWA. Focus is essential. Personal income and spending (NYSE:F). Can the recent strength continue? New home sales (NYSE:M). A decrease is expected, but how much? Michigan sentiment . An important concurrent indicator for employment and spending. Is there an election effect? Consumer confidence . See Michigan sentiment. This is almost as good and usually correlated. Initial claims (Th). The best concurrent indicator for employment trends. Pending home sales (Th). 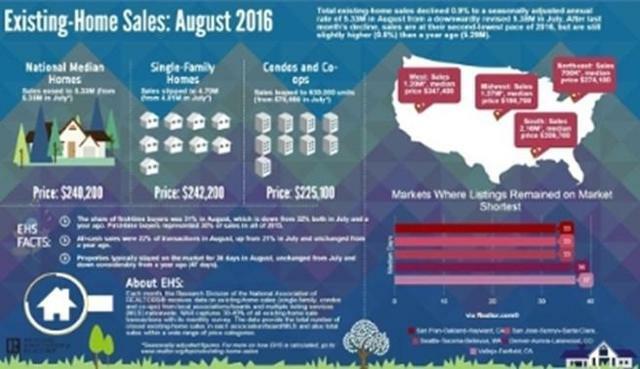 Not as important for the economy as new homes, but still a good read on the market. Chicago PMI . The most important of the regional indexes, especially when released on the Friday before the ISM index. Durable goods orders (NYSE:W). Highly volatile August data with a big monthly decline expected. Any chance of an upside surprise? Core PCE prices . The Fed’s favorite inflation indicator, so it is worth watching. GDP third estimate (Th). Few are interested in the final revision (before later benchmarking) of Q2 GDP, but this is what goes into the books. Crude inventories . Often has a significant impact on oil markets, a focal point for traders of everything. The first Presidential debate will be a news highlight with markets paying attention. FedSpeak is back in full swing. Chair Yellen testifies on Wednesday before a House committee on bank supervision. Most investors would prefer to tune this out, but we can no longer avoid it. The polls have tightened. We are on the eve of the first of three Presidential debates. It is expected to attract more viewers than the Super Bowl. Debates are always important, but this time is really special. The debate will provide a focus for the news cycle, including the financial media. I expect that everyone will be asking: Should the election news cause investors to change course? Please note that this is not a post with political advocacy. Everyone should vote as they choose, and for whatever reason. That said, it is important for investors to understand what is anticipated by markets, and the likely result if things change. I have worked to find articles that reflect a mainstream viewpoint. As always, I welcome alternative suggestions. We have three key questions. Out of hundreds of posts on these topics, here are a few that are good. Think of it as a starting point. Who will win? Nate Silver, whose methods have done well, gives Clinton a chance of about 60%. Larry J. Sabato now has Trump leading in the Electoral College. Paul Ryan should know. He sees changes in tax policy, regulation, entitlements, and anti-poverty programs. Economist Mark Thoma warns about problems in taxes, spending and economic growth. Niall McCarthy (via GEI and Statista) has something of a mainstream viewpoint, citing Moody’s. Whether you agree with these conclusions or not, it probably reflects the current street expectations. Also see Nanette Jacobson of the Hartford Funds. Will Congress agree? Important, but little good work. Whether you are a trader or an investor, you need to understand risk. Think first about your risk. Only then should you consider possible rewards. 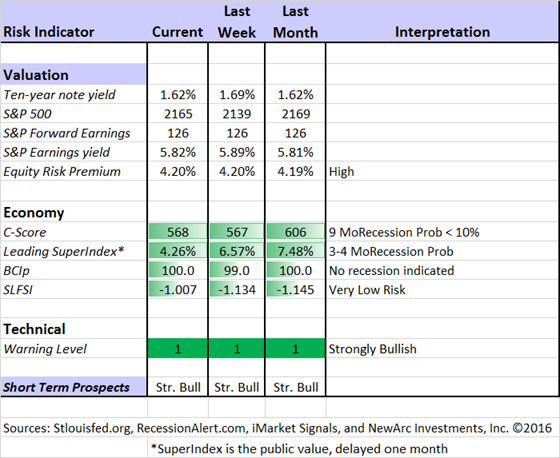 I monitor many quantitative reports and highlight the best methods in this weekly update. Brian Gilmartin: Analysis of expected earnings for the overall market as well as coverage of many individual companies. Why it is a great time to own for Value Stocks – finding cheap stocks based on long-term earnings. We continue with a strongly bullish market forecast. Felix is fully invested. Oscar holds several aggressive sectors. The more cautious Holmes also remains fully invested. They now have a regular Thursday night discussion, which they call the “Stock Exchange.” This is the place to get some ideas from the best technical analysis – and you can ask questions! I recall speaking with a successful trader who told me that he was excited about the opportunity in the marketplace. I responded by saying that he was the first person I’d spoken with to tell me that. Everyone else was lamenting the lack of opportunity in markets. He said, “That’s right. I’ve always made my money going against the consensus!” That was shortly before the events of Brexit. That trader was able to capitalize on opportunity because he not only saw the world differently, but experienced it differently. Adam H. Grimes also takes up the need for creativity and how to accomplish it. He draws upon his experience as a musician, and includes some other great examples for his proposed five steps. The key point is that if perceptions are (or become) misaligned with reality, investors may engage in “surprising” behavior that seems inconsistent with their risk tolerance. For instance, an individual who is highly risk tolerant, but has the (mis-)perception that a calamitous economic event will cause the market to crash to zero, might still want to sell everything and go to cash. Even though he/she is tolerant of risk, no one wants to own an investment going to zero! In addition, the research suggests that some people may have better risk composure than others; in other words, some investors can keep their composure and maintain a consistent perception of the potential risks around them, while others have risk perceptions that are more likely to move wildly. 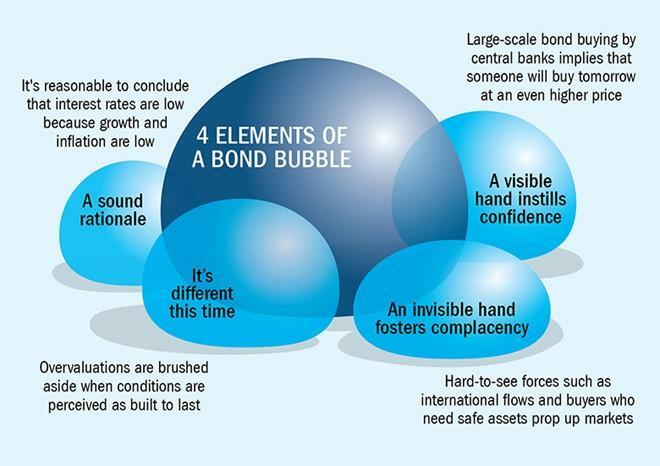 Unfortunately, many people still invest as if bonds are priced to return 6% to 8% per year or more going forward. We continue to see significant inflows into bond funds and ETFs as well as balanced funds with a considerable allocation to longer-term bonds. These decisions are especially risky for retirees, whose greatest investment risk entails holding too much of their portfolio in assets that won’t produce an acceptable long-term return, such as low-returning bonds. Chuck Carnevale continues his analysis of high-quality dividend stocks, searching for those that are fairly valued. His discussion of Flowers Foods, Inc. analyzes the stock and also provides an important lesson. David Van Knapp analyzes which of the “dividend contenders” might be at risk. Eddy Elfenbein has a great annual stock list and frequent updates about those stocks and the overall market. His clever commentary is appreciated by all, including those who follow him on Twitter. This week he launched an ETF (CWS after the name of his blog, Crossing Wall Street). The ETF will hold his recommended stocks, which you can buy without making twenty different trades. The news is explained in this interview with Abnormal Returns. 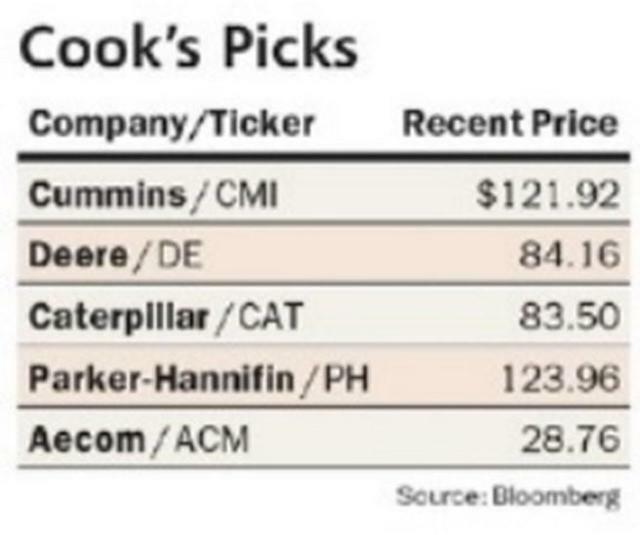 I also enjoyed this Bloomberg interview, which also includes some of Eddy’s stock picks. Peter F. Way’s approach measures the hedging used by big-money players. This week he calls attention to biotech stocks finding 70 that are attractive to institutional investors. Infrastructure stocks are poised to gain no matter who wins the election. Barron’s interviews Jamie Cook, a top-ranked CSFB analyst. Knowledgeable investors can probably guess some of her key picks. Our newest trading model, Holmes, has been contributing an idea each week, something we bought for clients a few days ago. I will mention it here, but you can see it sooner (along with other interesting ideas) if you read my new weekly column, the Stock Exchange. I have a “conversation” with disciples of our four trading models. Since each has a different personality and style, there are often disagreements – especially with me! While we cannot verify the suitability of specific stocks for everyone who is a reader, the ideas may be a good starting point for your own research. Holmes may exit a position at any time. If you want more information about the exits, just sign up via holmes at newarc dot com. You will get an email update whenever we sell an announced position. This week Holmes added several stocks, including CVS. See the Stock Exchange for a more complete analysis and ideas from the other experts. Professional investors and traders have been making Abnormal Returns a daily stop for over ten years. The average investor should make time (even if not able to read AR every day as I do) for a weekly trip on Wednesday. Tadas always has first-rate links for investors in his weekly special edition. There are several great choices worth reading. My personal favorite is (once again) our winner of the “best of the week” honor (see above). I also liked the “secret to a good marriage” from Suzanne Woolley. Hint: This is a financial secret. How much is it OK to spend without talking with your partner? Answer for yourself before reading the article, which is both entertaining and quite important. (For guys, I advise not learning the cost of salons and something called a Mani Pedi. Mrs. Old Prof informs me that men also get Mani Pedi’s and I am hopelessly out of date. She does, however have ideas about the appropriate spending limits. The ratio is about 5:1). Josh Brown, who expertly helps individual investors by revealing behavior of some pros, highlights the importance of the “career risk trade.” Many managers are chasing the returns from the last twelve months. A bond bubble? Jim Cielinski looks at persistent buying despite valuations. He identifies four elements and produces this interesting graphic. I have an answer for each of the three questions. On a personal note, this is a sweet spot for me. Given my combination of skills – top college debater, coach of the Michigan team, political scientist, and student of presidential debates — this is a good topic for me. For most of these debates the expert commentators on TV were my colleagues as coaches and judges, from back in the day. Mrs. OldProf was originally amazed that they echoed my comments. Then she came to expect it! Who will win remains in doubt, but the first debate will be crucial. It could represent a change in what is important. Most presidential debates have emphasized short sound bites to convey a message, regardless of the question. That is what the coaches teach: Get your message in there! Incorrect statements of fact have been pounced upon as gaffes. There is a long history. There is also an equalizing effect. Both candidates are on the same platform. The visual and emotional impact may be as important as the substance. One observer even suggested that we should watch with the sound off. (That would facilitate watching Monday Night Football at the same time). Both candidates want to spend on infrastructure, which will be an economic stimulus. This will require compromise with Congress. Ostensibly a Republican would have an advantage, but there is dissension in the ranks. Initial decisions will include some executive orders, so there could be an immediate effect on health care and immigration. The dynamic with Congress will be crucial. A new president needs to forge some compromises on spending, tax reform, trade, foreign policy, health care, and defense. Without knowing the Congressional results this is nearly impossible to predict. Not on the list of question — I expect a progression of reduced uncertainty. This week we’ll have more definition of the outcome. After the election we’ll know more about Congress. After a few months we’ll have more sense of the dynamics and the potential for compromise. Political uncertainty has limited economic growth, earnings and stock prices. As the uncertainty is resolved, all will improve. Far from “stopping weapons before they get to the cabin” the TSA is just screwing with people. If Trump should pull decisively ahead in the presidential race this week, I think uncertainty in the marketplace will be INCREASED, not decreased, and stock prices will suffer, perhaps significantly. The major elements of a Clinton presidency would be pretty easy to anticipate and adjust to. With Trump, however, nobody knows much of anything, including even Donald I suspect. So – I disagree with part of your political thesis. Ray — The market seems to agree with your comments about Clinton. Plenty of people involved in the market (who do not necessarily dictate market direction) believe that a Trump victory would be better for the economy. If the Clinton lead persists we will never know about the alternative. Your observation is sound, but Presidents do not get their way as much as most suspect. Thanks for joining in! In Democracy Journal (http://democracyjournal.org/magazine/42/the-private-debt-crisis/?utm_source=Democracy+Journal+Article+&utm_campaign=9%2F26%2F16&utm_medium=email) Richard Vague opines that the total debt to GDP ratio has a limiting effect on economic growth, has risen vertiginously, accounts for our observation of slower than expected economic growth, and can be expected to strangle economic growth going forward, absent a major restructuring. I was wondering if you agree with his ideas. John — I am not familiar with Vague. It does seem like he has mostly opinions with a few charts tossed in. There are some major economic studies on these topics, with an active debate. As to my own thinking, I am not surprised to see private debt rising when you can lock in low interest rates for a long period. Or when you get 0% financing on a car. Corporations sell bonds and pay them off. Put aside, for a moment, our opinions on how the money is spent. Suppose you were a CFO and you could choose to raise capital by selling stock or issuing long-term debt at a very low rate? It should be no surprise that many companies are choosing the latter. A thoughtful question — thanks.